Introduction: Since the introduction of natural orifice surgery, proof of safety is required before this approach can be generalized. Specifically, documentation regarding standards for transvisceral closure remains limited. Previously proposed models center around pressure based testing as a way of reliably assessing closure. There has been no assessment of the clinical relevance of pressure testing for visceral closure. We propose that intraluminal pressure testing may not be the ideal standard on which to judge integrity. Methods: Prospective evaluation of patients undergoing elective laparoscopic colorectal resection with pelvic anastomosis. Bowel was insufflated under saline irrigation until no further distention of bowel could be identified. Measurement of intraluminal pressure generated during leak test was performed using pressure tubing affixed to a sigmoidoscope or bulb syringe. Patients were followed for 30 days and monitored for leak rates and intra-abdominal infectious complications. Results: Twelve patients (10 female) were enrolled between 7/09 and 5/10. Mean age was 64 years (range 48-78). The bowel was occluded proximal to the anastomosis. Three independent measurements of intraluminal colon pressure during anastomotic leak testing showed a mean pressure of 27.5 ± 12.7 mmHg. All patients were followed to 30 days. There were no anastomotic leaks. No postoperative abscesses were identified. One patient was readmitted for fever work up with CT showing no organizing abscess or leak. Conclusions: In this prospective trial, intraluminal pressures identified during leak testing for colorectal surgery are lower than those previously accepted for models testing transvisceral closure. When applied to transvisceral closure, applicability of these lower pressures may allow the use of closure devices that were previously deemed ‘unacceptable’ by current pressure testing standards. 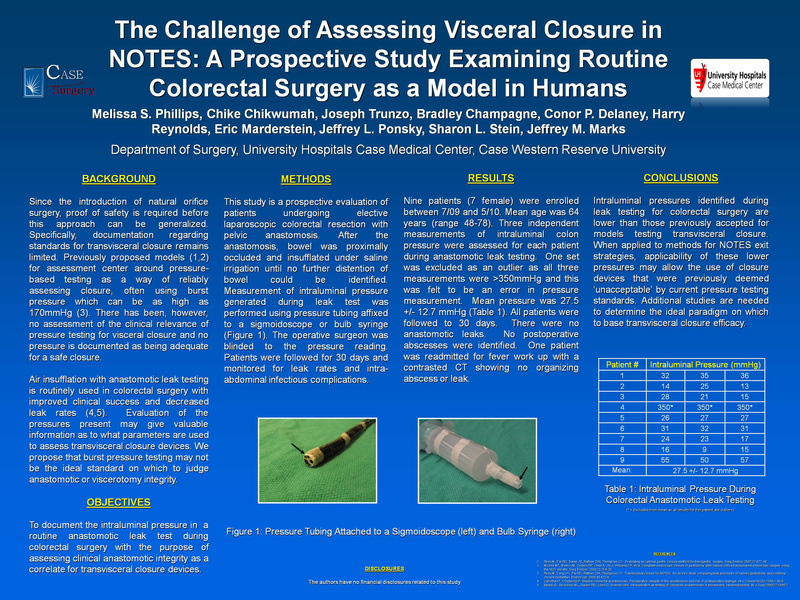 Additional studies are needed to determine the ideal paradigm on which to base transvisceral closure efficacy.